This small cave just east of Les Eyzies contains remarkable polychrome paintings over 17,000 years old. Ever since we visited Lascaux II, the wonderful reproduction of the prehistoric cave paintings at Lascaux, we have wanted to see an actual cave. A recent trip gave us the opportunity to visit the Grotte de Font-de-Gaume in Les Eyzies-de-Tayac-Sireuil. The Font-de-Gaume is proud to be "the last cave in the Aquitaine basin with polychrome paintings still open to the public." It has over 200 paintings and engravings of bison, horses, mammoths, and reindeer, as well as a few stylized human figures. The paintings are multi-colored and beautiful, though faint. They date from the Magdelenian era, about 17,000 years ago. The cave was discovered in 1901 and helped to prove that the paintings previously discovered in other caves did in fact represent Paleolithic art, a fact that many skeptics found difficult to accept. The Grotte (Cave) de Font-de-Gaume is 1.3 km east of the Musée national de Préhistoire in Les Eyzies (map), overlooking the valley of the same name. It is easily reached from Sarlat (20 kilometers/12.5 miles to the east, about a 30 minute drive). Because of the fragile nature of the Font-de-Gaume site, admission is strictly limited, and only a small number of tickets is sold each day. Currently, fewer than 80 visitors are allowed per day, subject to change. Carbon dioxide levels are monitored regularly to ensure that the integrity of the cave is protected. A few tickets are sold on line, starting in January for the coming year, but the majority are sold at the Font-de-Gaume ticket office, starting at 9:30 on the day of the visit. Plan to get to the ticket office early in the morning and wait in line. Benches with numbered seats keep prospective ticket-buyers in order of arrival. When we visited, we arrived at 9:10 AM and got tickets for 10:45, but in the height of the summer or other busy times you may need to arrive by 7:00 AM to get a ticket. You can only buy tickets for people who are actually present. You cannot send one person to wait in line and buy tickets for others. Half an hour before your assigned tour time, start the 10-minute walk uphill to the cave entrance. Be aware that this is on a paved walkway but the climb is fairly steep. Those with mobility issues should allow ample time. Although most guided visits are in French, the ticket office tries to schedule English-language visits to meet the needs of Anglophones. The guided tours are limited to 12 visitors at a time. The French-speaking guides are very knowledgeable. If you understand at least some French, the guides may be able and willing to translate a word or phrase to English from time to time if necessary. You will be inside the cave for about 45 minutes, walking on a man-made walkway or on the cave floor in low light. You'll travel about 120 meters (400 feet) into the cave and will return along the same route. If you suffer at all from claustrophobia, this is not the place for you! Passages in the cave can be narrow, and in some cases low. You may need to duck your head from time to time, but we had a 6-foot, 6-inch- (201-centimeter)-tall man in our group and he did fine. Do not bring any large bags. At the entrance to the cave you will have the opportunity to lock up purses and backpacks for the duration of the visit. No photography is allowed in the cave. The temperature in the cave is comfortably cool. If you're dressed for hot summer weather, you may want to bring a sweater or light jacket. There are toilets just before the entrance to the cave, and of course a small gift shop in the ticket office. Your guide will provide an overview at the entrance to the cave and will then lead the group in. Lighting in the floor and along the sides allows you to see where you are going. From time to time the guide will stop to point out specific paintings or drawings. It can be difficult at times to tell where the art begins and the cave wall ends, and it is very helpful to have the outlines shown. The guide's explanations also provide information about the history of the discovery and subsequent studies. The drawings are often faint, but they are unmistakably human-made. It is thrilling to be in the presence of works of art that have existed for thousands of years! —Why did they paint and draw deep inside these caves? —How many artists were there? —What do the paintings mean? Are they celebrations, prayers, curses, or simply individual expressions? Is it significant that this reindeer is pointing out of the cave and that one is pointing in? Archaeologists have spent—and will continue to spend—years trying to understand the people who created these works of art. For the rest of us, appreciating the art and the links across thousands of years is awe-inspiring. Is it worth it? Of course that's for each individual to decide. For us, the directness of the art—from the artist's hand to our eyes—and the connection across thousands of years was exciting. If you're inspired by Font-de-Gaume and want to see more, you might also want to visit the nearby Les Combarelles, L'Abri du Poisson, L'Abri du Cap Blanc, and the Musée national de Préhistoire. 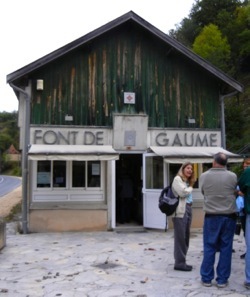 Above, The small information/ticket office for Font-de-Gaume and other sites near Les Eyzies.